Sitting on the steps of the house that Dad built. I’m the little one. Circa 1962. I’ve just moved house. Something to be done as infrequently as possible, if you want my post-move opinion. It’s less than two years since I last did it – and this time I’m planning to stay put for a very long time. This is the 18th place I’ve called “home” in my lifetime. When I counted them up on my fingers just now, it gave me quite a shock. Eighteen places I’ve lived and loved in, and said “goodbye” to. And I mean that literally. Almost every time I’ve moved on, I’ve taken time – alone – to walk through the empty rooms and say goodbye to the house. I say it aloud: “Goodbye house. Thank you.” I remember the good times I’ve had in it, and have one last look around. Does that sound silly? I hope not. It’s something I’ve always done, instinctively, and I know others who confess to doing it too. 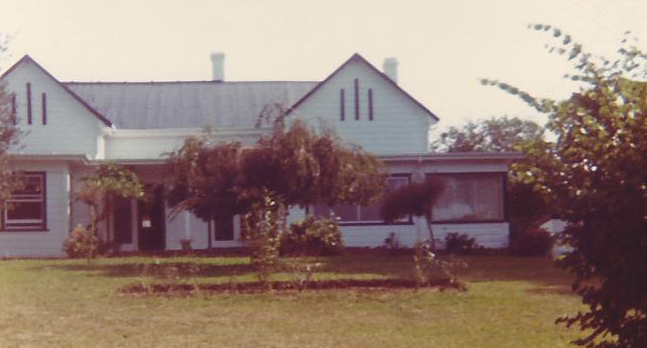 I grew up in the weatherboard house that my father – a carpenter – built after my parents married in 1949. Set on a half-acre block, it was a two-bedroom place – until I came along. Then Dad converted the laundry into a third tiny bedroom for me; my sisters shared the other room until they grew up and left home. I loved that little cocoon and when the others had left, stayed there rather than move into the bigger room. I didn’t say goodbye to that house; my parents moved to a place on a smaller, flatter block of land while I was living overseas. A couple of years ago the house was up for sale and my mother went along to an “open house”. She said she barely recognised it, so many changes had been made during the intervening years. This rambling old New Zealand villa was full of life and parties. When I was 19, I moved out to live in a share house with two friends. It was the first of several. Two rambling old New Zealand houses filled with music, parties and mad antics; a mansion flat in London’s West Kensington; a brief stint in a riverfront apartment at Surfer’s Paradise on Australia’s Gold Coast; back to London, to a falling-down old terrace house in Notting Hill; a snow-bound three months in a high-rise apartment in Edmonton, Canada, as a newly-wed; three places in two years in Melbourne – the servants’ quarters of a grand mansion in Kew, a townhouse in Glen Iris and a cute worker’s cottage in Hawthorn. Then two years in a pre-fab company house in the Saudi Arabian desert, where my husband was posted; an exotic and exciting time, full of travel and learning. Returning to Australia, we bought a modern house surrounded by trees near the Brisbane River. When baby number 2 came along, it was suddenly unsuitable and we invested in a Queenslander cottage when we extended and renovated into a beautiful home in which to raise our children. We stayed there for 13 years – apart from my childhood, the most settled time of my life. There was an almost-two-year hiatus during that time, when a move to Central Queensland saw us once again in company housing. Later, after a move to Melbourne, we found a two-storey Tuscan-style villa, painted a warm, deep yellow and smothered in ivy, in the heart of bayside Elwood. There were olive trees growing in the courtyards, and a massive bay tree outside the kitchen door. Five years ago, living on my own for the first time in my life, I found an Art Deco flat in St Kilda which became home for three years. Returning to Brisbane last year, I rented the basement flat in a Queenslander cottage while I looked to buy. This week, I packed everything up again to move in to a place I can truly call my own. 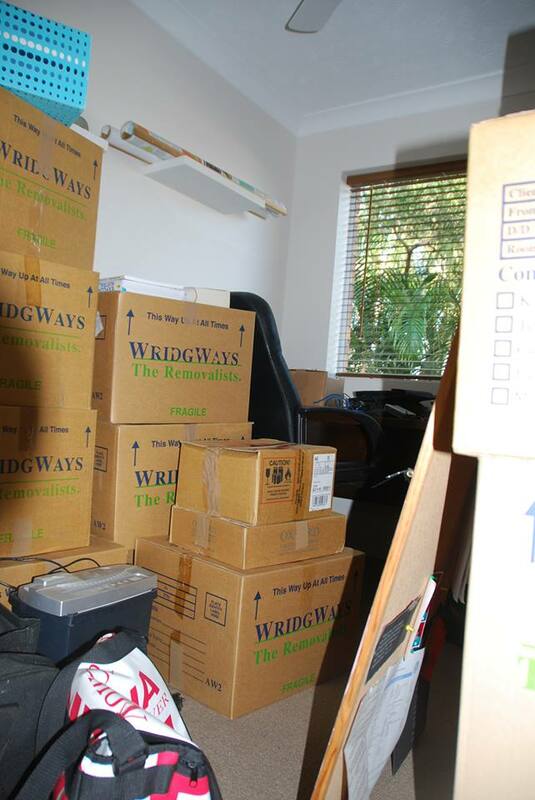 Somewhere among those boxes is my desk! Now, surrounded by packing cases and bags stuffed full of a lifetime’s “stuff”, I hope it’s a long time before I have to move again. But I look back fondly on all those places and the memories they hold for me. My childhood home might be unrecognisable and my first shared house has been demolished, but the rest of them are places I hold in my mind’s eye and could walk through blindfolded all these years later. My new office looks out onto trees shielding my apartment from the house next door. It’s light and sunny, and I just know it’s going to be a place I’ll enjoy sitting and writing. I’m not sorry to have said goodbye to renting…hopefully forever. Lovely story Lee. Your comment about saying goodbye to your houses resonated with me. When I sold my last house, where I had lived for 25 years, I had to hand over the keys as the last removal truck was driving out of the driveway. I’d envisaged the same reflective walk through the empty rooms that you’ve written about, and I still regret that the last-minute rush meant I was unable to do that. After busting a gut to quickly run the vacuum cleaner over the place and do a last-minute clean before handing over the keys, my daughter and I sat in the car and cried. My children had spent all their lives in that house and it wasn’t the goodbye I’d imagined. I’m hoping for a more sedate farewell next time around! Wonderful story and well written. But I wonder, how many computers have you had? Not as many as 18. Maybe about five. I only upgrade when they die. But I may change that very soon…sick of this old one. Funny. When I consider a place to live, I can somewhat feel the energy in the place–and the way you describe this, I’m sure you brought much good energy to each one. Eighteen! You are a trooper, Lee. I’m not sure I could survive that many moves! I agree, Kris. It’s all about the energy of a place. I looked at a few places that “ticked the boxes” but just didn’t feel right for me. This one just yelled “buy me!”. As for the moves, a lot of them were with my ex-husband’s job, and it was just part of life. I loved exploring new places and getting to know them as a local. But equally happy to stay put and always have a home base to come back to. Ewww. I’ll leave that little piece of work to you (and any dogs you know). What a lovely piece! Written with heart and soul.